Keeping up with water chemistry is an important aspect of Seminole pool cleaning. Staying at the right level of chemicals is imperative in keeping the water healthy and safe for swimming. A simple understanding of the different components will get you far in the maintenance of your personal watering hole. These different components are measured by ppm (parts per million), and there are four basic elements that need to be kept track of, in order to maintain clean water. Chlorine is what makes your Seminole swimming water safe to enjoy. Without it, your lagoon would be full of potentially very harmful bacteria and algae thus it should be added on a regular schedule. Chlorine will kill these various types of bacteria through a pretty simple chemical reaction. A pool cleaning technician will know when and how much chlorine to add in order to keep the harmful elements away. 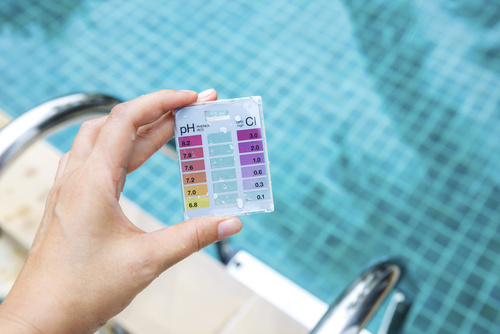 PH is a way of expressing the acidity of a solution; this is important to the upkeep of your water chemistry in Seminole since pH will measure the effectiveness of the chlorine in your water. If you find your water’s pH level is less than 7.2 then it is too acidic. If it is above 7.8, then it is more on the alkaline side. You want the level to be between 7.4 and 7.6 and this should be tested 2-3 times per week, especially during high traffic seasons when you need pool cleaning more frequently. Alkalinity, which is in close relation to pH, is the measurement of all hydroxides, carbonates in the water. Alkalinity helps control your pH balance; it helps to ensure that it stays steady, since it would bounce all over the place it. Your alkalinity level should be between 80 ppm and 120 ppm for concrete pools and 125 ppm and 170 ppm for fiberglass or vinyl ones. Calcium can come out of solutions and can deposit itself on top of the water. If your water continuously has a high level of calcium, it can begin to cause serious damage. This can make pool cleaning a nightmare. Your calcium hardness levels should be between 200 and 400 ppm. If it goes above 500 ppm’s continuously, it could end up causing some costly damage. The truth is everything that comes in contact with your Seminole pool can affect that water’s chemistry. From hair care products to makeup, to rain water and dirt, everything can change the balance. So if you just want to be able to relax and enjoy your backyard oasis whenever you feel like it, call a professional pool cleaning service. This way you can enjoy yourself without having to worry about pH balance or when to add more chlorine. Here at Triangle Pool, we offer maintenance plans for the cleaning of your Seminole pool, and we will send the same expert each time, so you always know who to expect. If you want to enjoy your backyard oasis without having to worry about upkeep, contact us today or simply call us at 727-531-0473.